John Stinger has been an artist all his life and now he is giving much more back to help others. As the art curator for Straube Corporation and founder of The Fine Art Alliance, Stinger is in a unique position to help talented artists participate in no fee and no- percentage-of-sales shows that are especially appealing during this recession. And from the success he is having with his stunning bi-monthly art shows at the Straube Center, it is no wonder artists and art collectors are responding with keen interest. To understand why, his experience in the arts and marketing, explains it all. Born in Trenton, Stinger won an international poster contest as a teen and was presented the first prize award by entertainer Steve Allen. In his late teens, he was selling illustrations and cartoons to national sports and consumer magazines. His painting ability was first noticed by his high school art teacher who helped him win a full art scholarship. A large Delaware River painting measuring 12 x 16 feet entitled "They Dug Too Deep" won first prize in his home town painting contest. It depicted a prehistoric winged dragon re- awakened from his long slumber by the dredging taking place at the time to deepen the river. But that was only the start of his love affair with art. He studied painting and commercial art at the School of Industrial Arts in Trenton under Ben Elliott, John Slovak and Elizabeth Ruggles. The school was only several blocks away from the river's edge which always fascinated the young artist. He met Hazel Herman a publicist for Trenton Trust Bank then owned by Mary Roebling and located directly across the street from the school. Soon, Stinger had his first solo show at a private exhibition held at the Roebling Mansion in Trenton hosted by Roebling, who became his first collector. 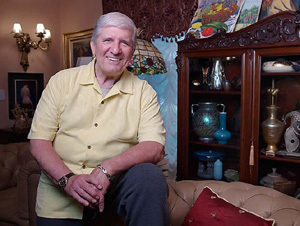 In early 1970s, Stinger and his wife Susanne moved to a stone farm house in New Hope where their daughter Karla was born. It was living in New Hope for many years and the influence of the Pennsylvania Impressionists that first inspired Stinger to develop his original style of painting. His early association with New Hope painter and frame-maker Ben Babura and Jack Wallace, head of the Portrait Department at Pratt in New York city, enabled him to recognize, as well as collect paintings by well known New Hope artists from that period. The Stingers moved to Stewartsville in the mid-1980s buying a small farm property and turning it into an artist's haven with flowering bushes, a winding stream, stately pine trees and a new light -filled studio where John paints every day. He calls it a "landscape painters dream" because he doesn't have far to travel to see nature in all its' glory. Stinger specializes in Pennsylvania, New Jersey and New York landscapes, and snow scenes painting in oils on location but finishes his work in the studio. He has traveled throughout the U.S. and Europe always looking for those special places to paint. A year ago, Stinger teamed with Straube Corporation CEO and international art collector Win Straube and together they are offering dedicated artists an opportunity to participate in six bi-monthly shows at the Straube office and retail complex in Pennington. Stinger selects the talent and curates all shows for the company. The bi-monthly events are causing a stir in the art community and are open seven days a week at the Straube Center. Admission is free to the public and the selected artists are never charged a fee for space and no percentages of work sold is ever collected, thanks to both men. Stinger is always seeking talented local artists to join him in his active fine art show program. Artist workshops, seminars and demonstrations are also scheduled to begin in the fall at the Straube Center. Many of the teachers are art show participants. The spring Straube recently opened and runs through April 24. The summer show opens May 8 and ends June 26 followed by the second summer event opening July 9 until August. The highlight of all the shows will be the New Collectors Fine Art Show running Sept. 4 to Oct. 23. Students, collectors and art lovers are encouraged to attend these family- friendly events. For more information about applying for participation in the free art shows, or to be placed on the Straube Center Art Show invitation list, call (908) 319-8957 or visit www.stingerfineart.com.